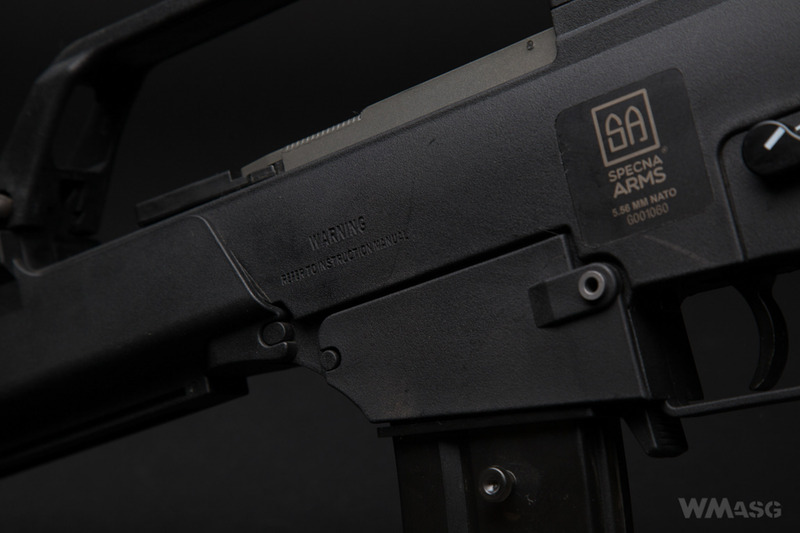 Specna Arms is a dynamically expanding brand. 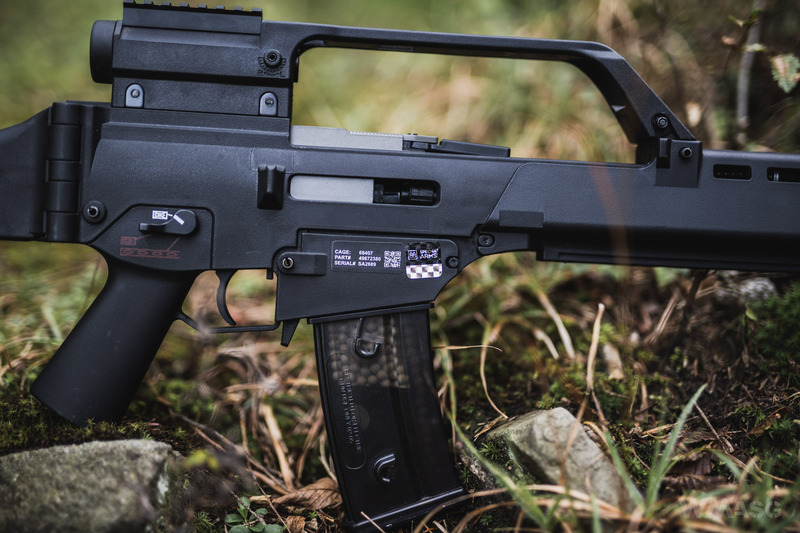 More models are being introduced into the market, and we got our hands on a carbine based on the G36K. How is it presents itself? Check it out yourself. 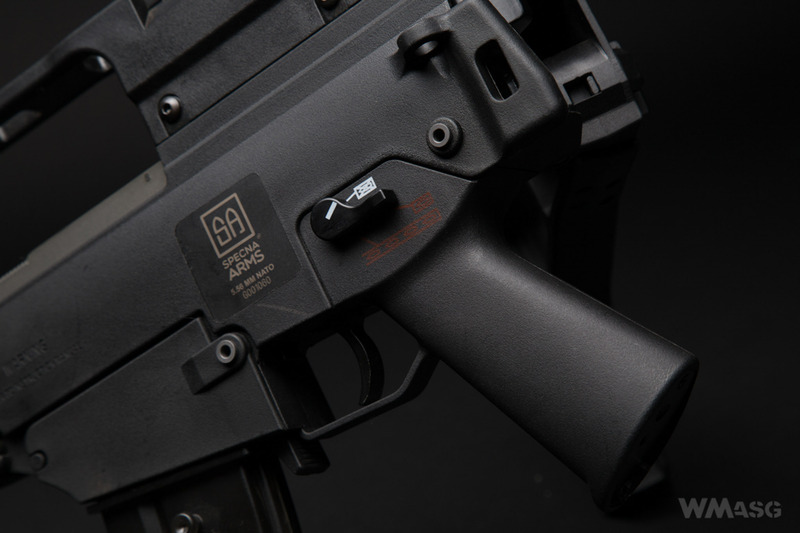 The reviewed carbine belongs to the SA-GXX series, which consists of replicas of several versions of the HK G36 rifle. The common feature of SA-GXX replicas is the EBB system, the quick spring change system and the spring release function is operated by the bolt catch button. EBB - electric blowback is a system in which the dummy bolt moves by being connected to the piston. The following text is a review of the SA-G14 model, i.e. a replica with side-folded buttstock and a high rail system with an integrated telescopic sight with fixed magnification. 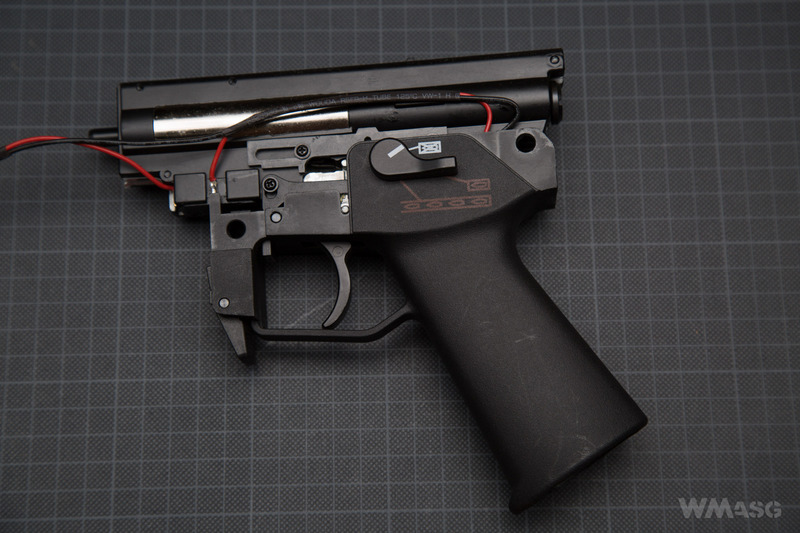 - a quality control certificate with 5 measurements of the muzzle velocity of this particular replica. - muzzle velocity: 375 fps. As you can see on the photo above, the replica is packed in a normal cardboard box which fulfills an unobtrusive marketing function. Inside, parts of the set are placed in dedicated sockets cut out in the foam insert. This sufficiently protects the carbine and its accessories. The carbine looks very good when held. The material from which it is made is black, matte, slightly rough. The outer barrel, the flash hider and the cocking handle, as in the real firearm, are gray. If not for the visible Specna Arms markings on the photos, I would take it for a replica of another, well known manufacturer. 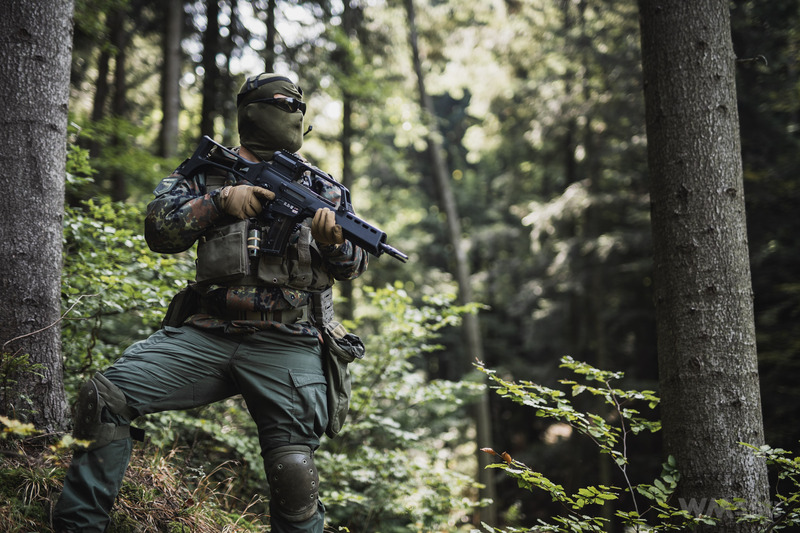 This would explain the excellent appearance of the rifle and the quality of the material it is made of. It would be a nylon-reinforced polymer. 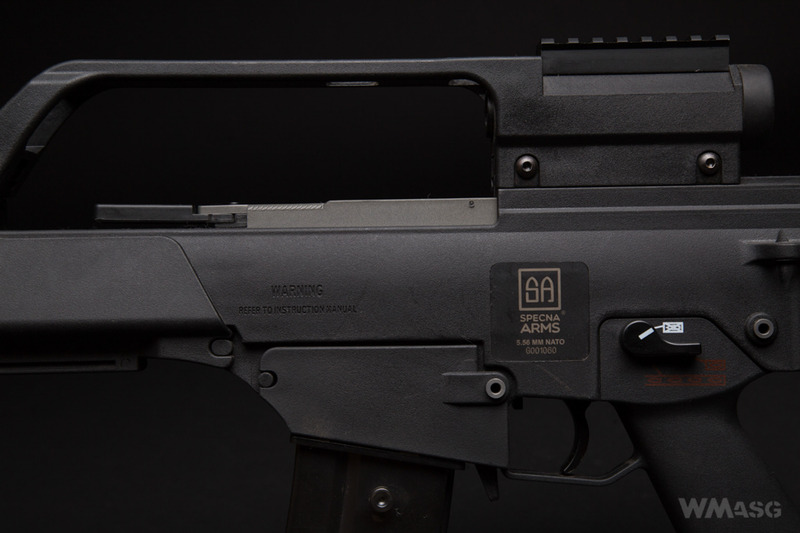 Coming back to external design, the carbine is equipped with a basic stock, folded to the right side, just like in the real weapon. After folding the buttstock is locked by the casing deflector. It is unfolded simply with a pull. 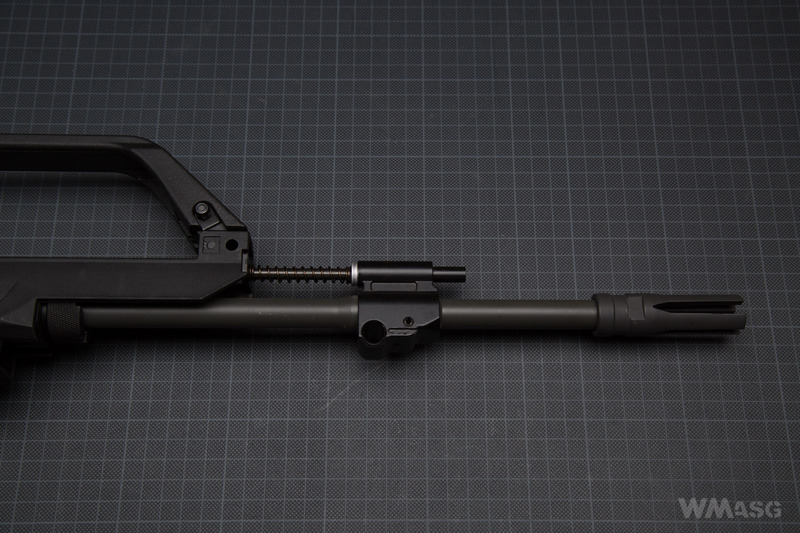 The action can be facilitated by first pushing the buttstock slightly upwards. The dummy bolt and the cocking handle, visible near the deflector are, as I wrote earlier, gray. The dummy bolt is made of a steel sheet. The handle is made of several plastic parts. 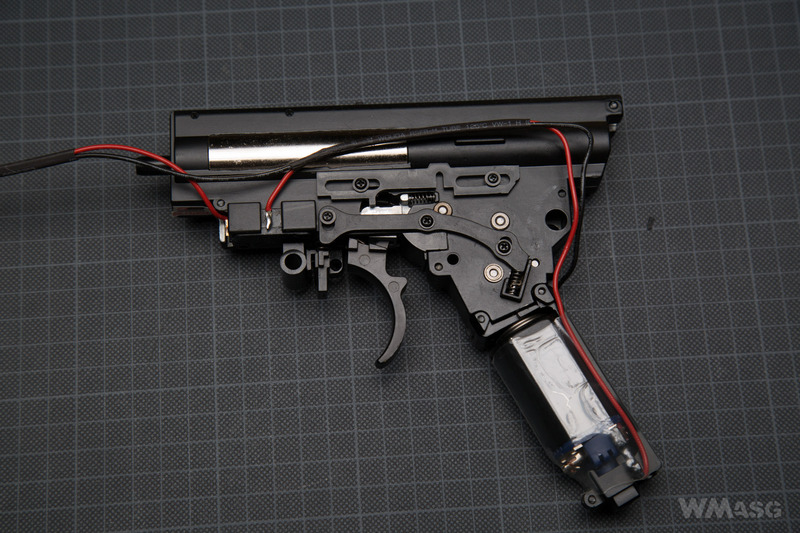 During shooting, both parts move which, in according to the designers, is meant to give the shooter a more realistic experience. This system is very imperfect. The recoil is obviously noticeable but overall insignificant. However, this is not a unique feature, or the defect of the reviewed carbine, but they way most EBB replicas work. This is the result of a compromise resulting from technological limitations. Bearing this in mind, shooting with this carbine is quite pleasant. For me personally a bigger problem is that the bolt can stop in any open position if we release the trigger when the piston is retracted. The entire EBB system can be easily disassembled and assembled if desired. By pulling the cocking handle back, we also move the dummy bolt and gain access to the Hop-Up adjustment. In replicas without the EBB system, the handle could be locked during the Hop-Up adjustment. The bolt remained in the rear position and adjustments could be made without any obstructions while making tweaking it after each shots. In this replica, due to the EBB, the handle will be released after each shot closing access to the chamber. More information about the design of the chamber and how the adjustment works will be given a bit further. 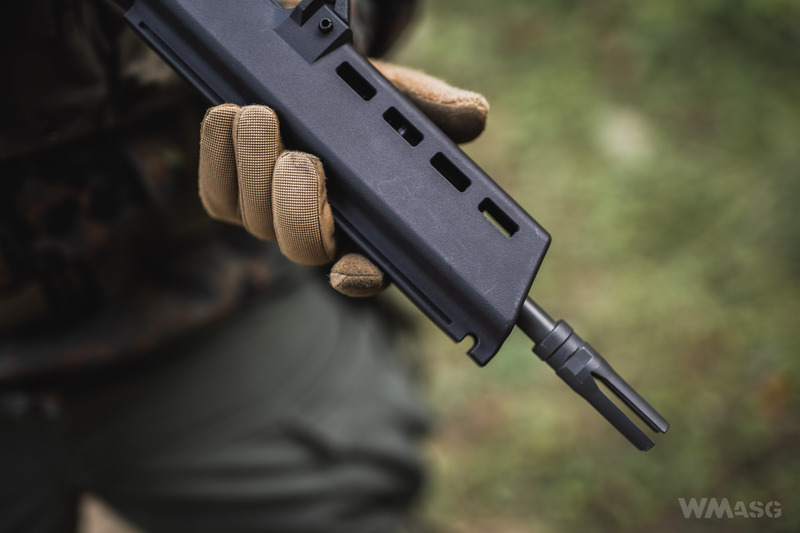 The carbine is equipped with a so-called high bridge rail, also referred to as a handle or carrying handle. 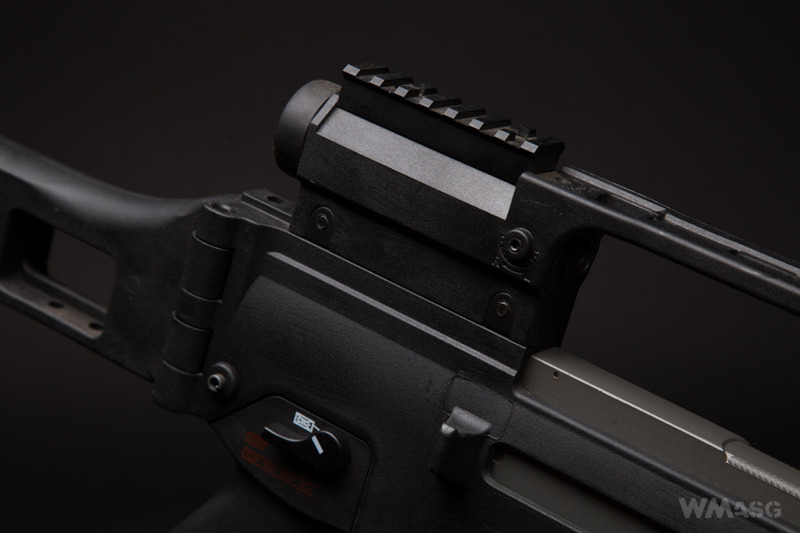 The bridge has an integrated optical sight with a fixed magnification of x1,5. The sight has a small diameter of the eyepiece - 11 mm and an even smaller lens, just 9 mm. To use it effectively you have to get used to it. For my old eyes, however, the bigger problem was the short distance of the exit pupil. Speaking in layman's terms, in order not to lose sight of the target through the sight, I had to move my eye very close to the eyepiece. Close enough that I pressed my protective glasses against the sight's case. And again: it is a problem or a feature of many other optical sights. 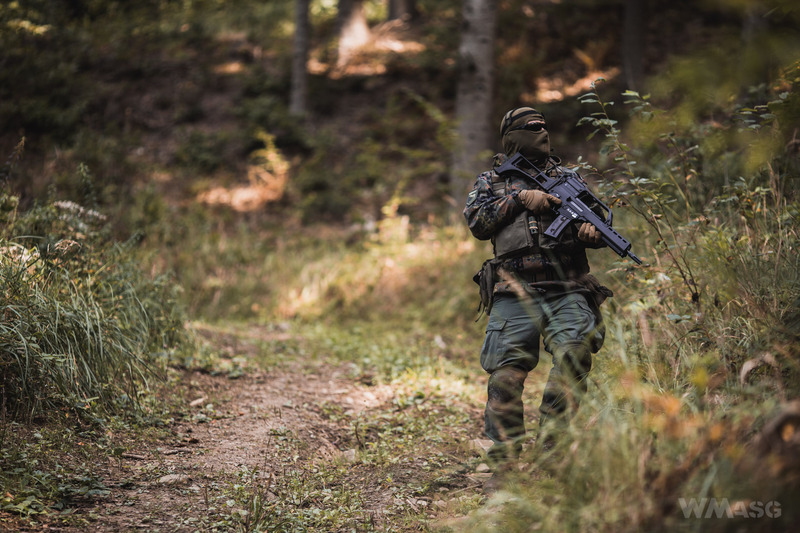 Both intended for firearms and their airsoft counterparts. 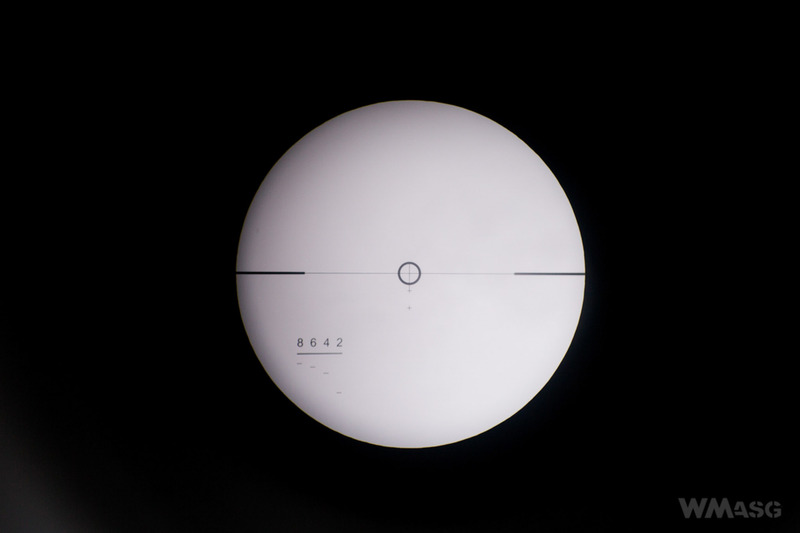 The scope's reticle allows an approximate measurement of the distance to the target and making corrections. 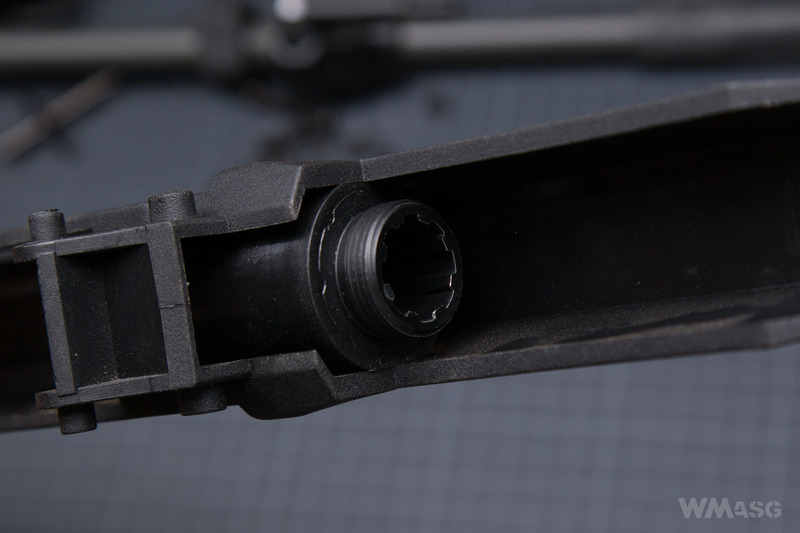 On the right side of the scope there is a screw for adjusting the reticle's horizontal position. The vertical adjustment screw is on the top of the scope. A short Picatinny rail in mounted directly on the telescope tube with two screws. It can be use for mounting another kind sights. If we do not want to use, for example, a reflex sight, and we prefer traditional iron sights, we must take off the rail. Then we get the access to nonadjustable front and read sight. 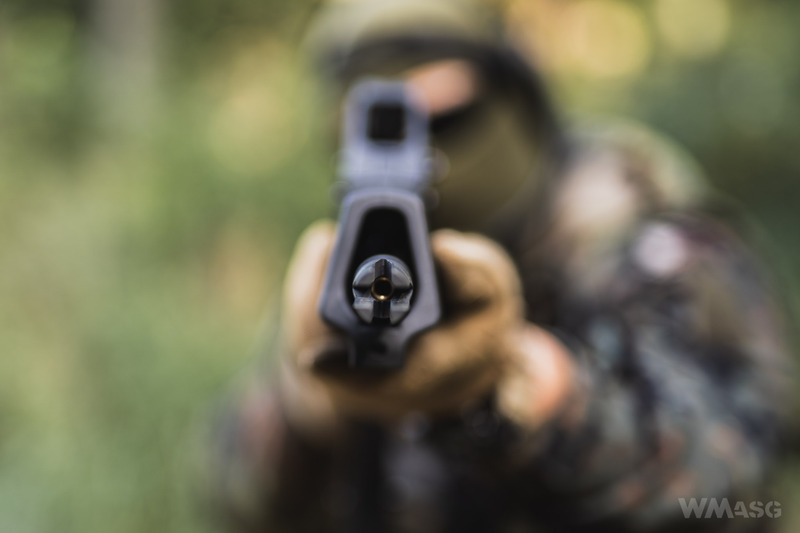 Without unscrewing the rail, the use of those "emergency" sights is impossible - the rail is too high. 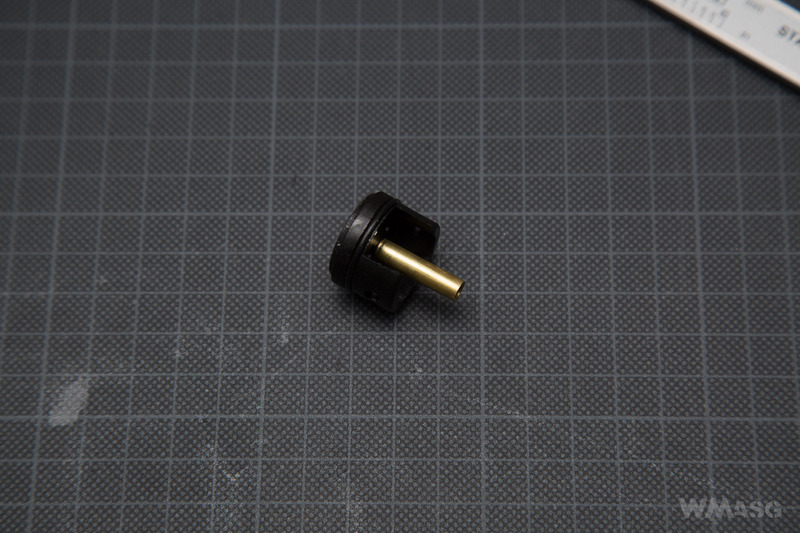 After removing it, the problem are the brass threaded bushings, in which the rail mounting screws are screwed in. They are in a golden brass colour - and its very visible. The bridge itself can be easily dismantled and replaced with a low one, which has a Picatinny rail along its entire length. One of the three mounting points can be seen in the photo above. It also acts as the front attachment point of a carrying sling. 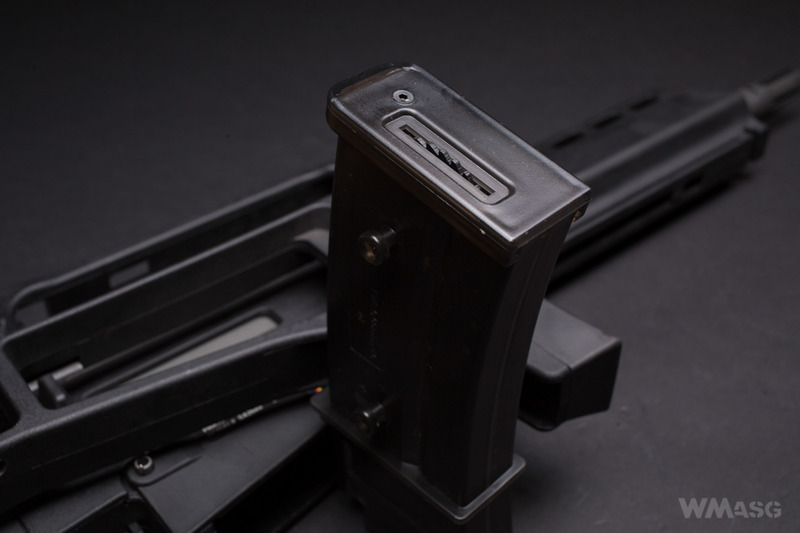 After taking the front grip off, which is a precise piece of work made from the same material as the receiver, we expose the external barrel along with the dummy gas piston system. The barrel is uniform and made from aluminium (ZnAl). 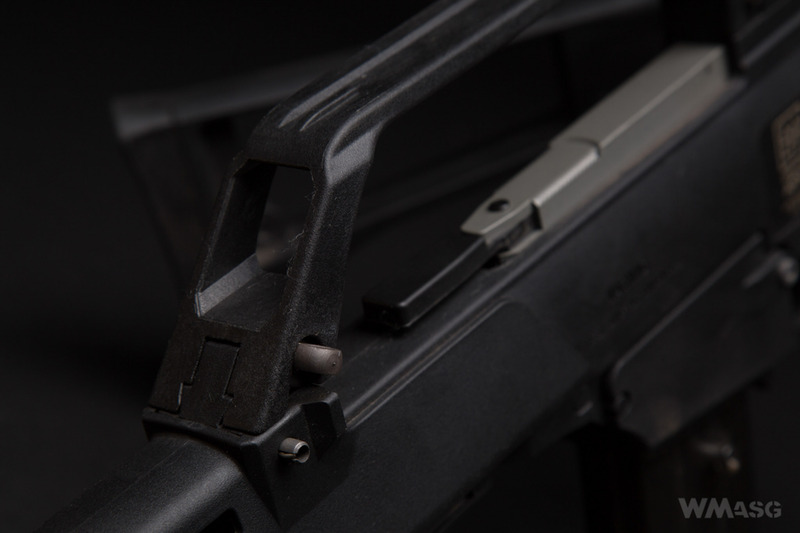 A separately made part is the spline used to mount the barrel in the carbine's receiver. The spline-barrel connection is durable, non-removable and push-fit. There is not slack. There are traces glue used in the factory. The barrel mounted in the reseived, in the socket for the above described spline, secured with a threaded ring. The barrel, the dummy gas system with the piston and the spring. The barrel ends with a flash hider typical for one found in the real firearm counterpart. 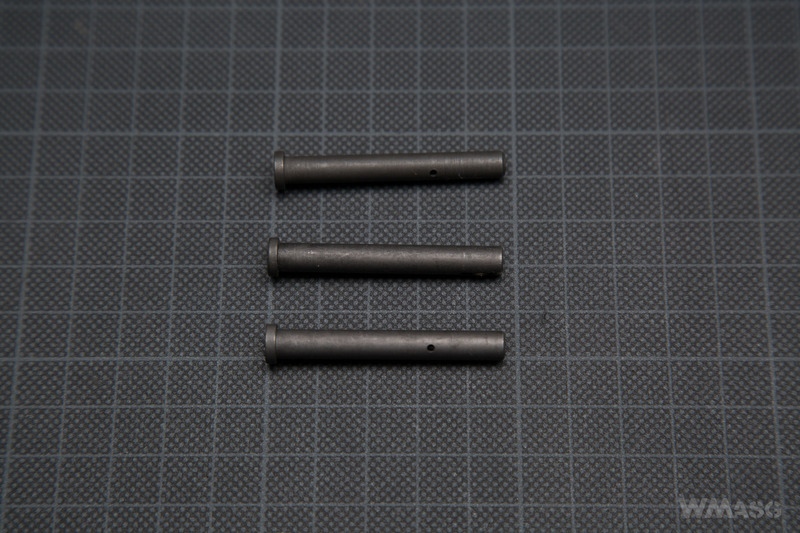 ATTENTION - the flash hider has a 14mm CLOCKWISE thread, which is different than in most replicas. 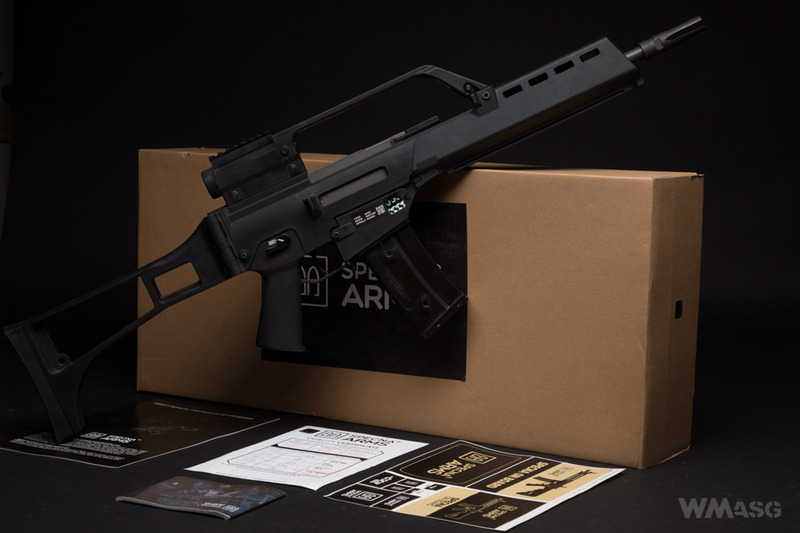 The outer barrel components near it confirm my belief that Specna Arms' replica is closely related to other G36 replicas. Everything is exactly as in the AS36 replica documentation found on the Ares website. 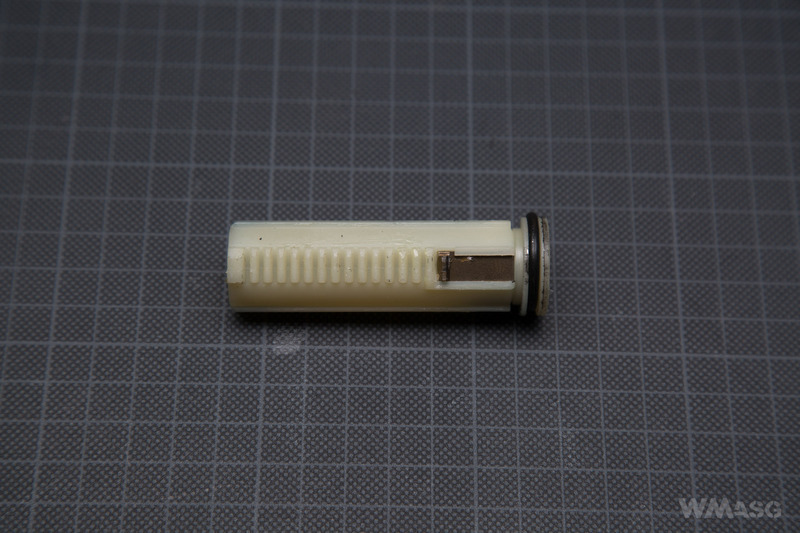 The space around the outer barrel is also the place designed to hold the battery. 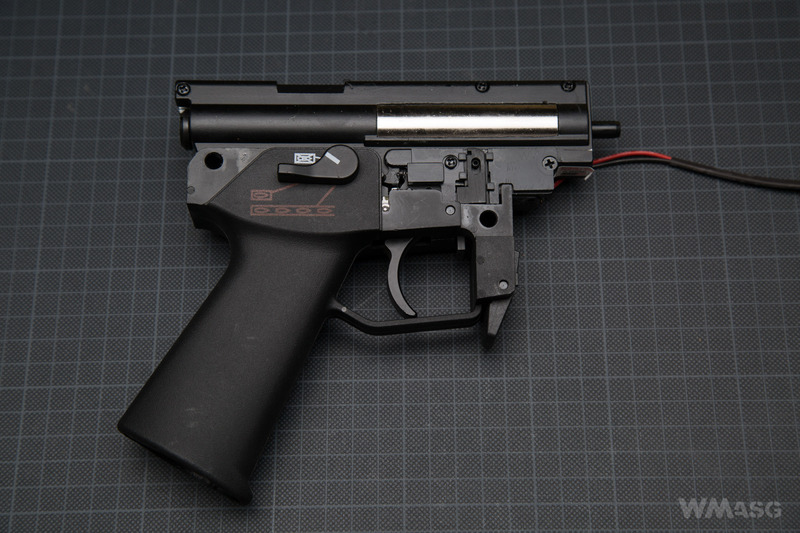 The magazine that comes with the replica is a hi-cap with a declared capacity of 350 BBs. 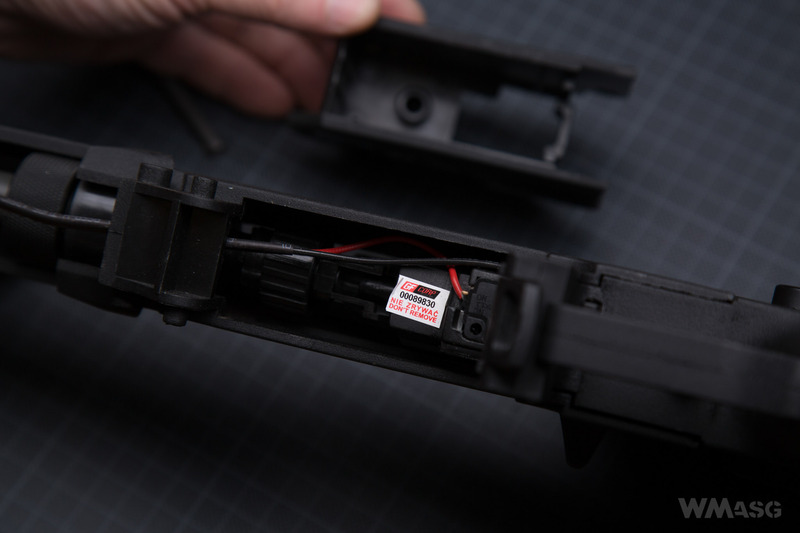 The magazine is entirely made of transparent plastic which allows to roughly can control how many BBs are left inside. The spring winding wheel is traditionally placed in the magazine floor. On sides, as usual, the magazine has studs which allow to connect magazines together. 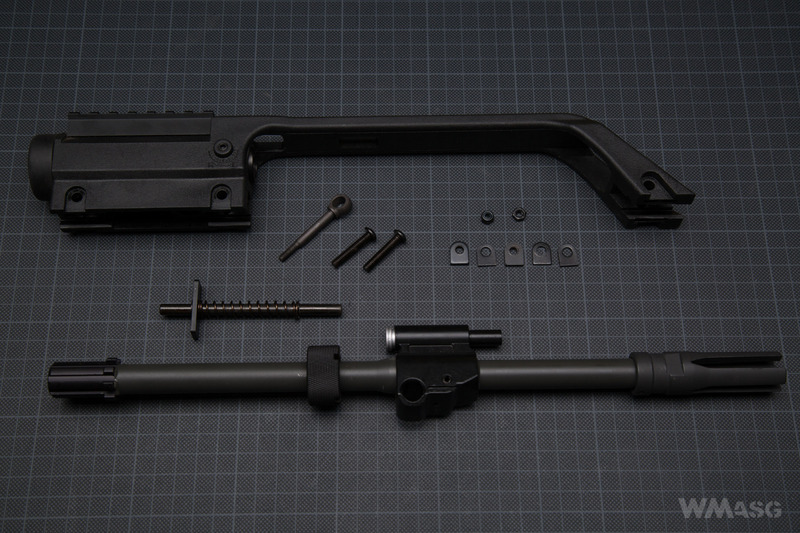 After taking out the pin at the and of the receiver and folding the buttstock, you can take out the bolt return spring buffer. This way we gain access to the main spring guide and this allows us to quickly change the spring itself. 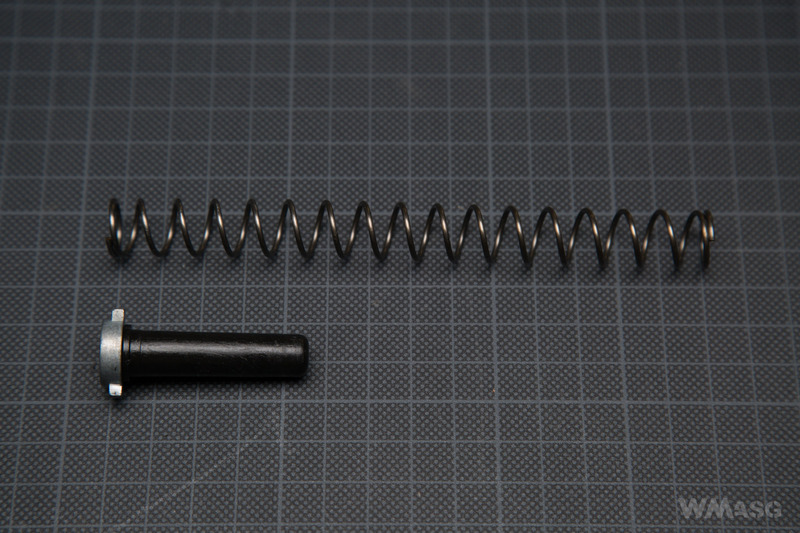 First you have to unscrew the screw that stabilized this spring guide. 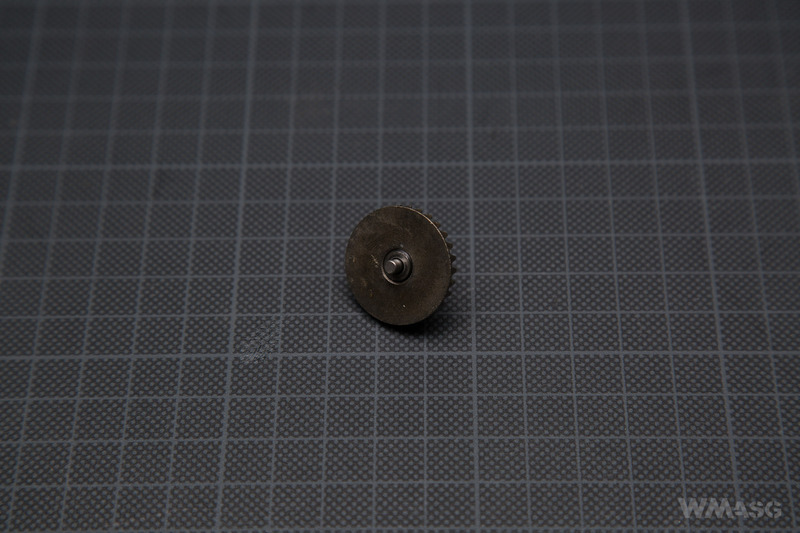 It can be done with a flat head screwdriver of a coin (even as big as a 5 PLN). Under the screw there is a socket for a 6 mm Allen wrench. It is enough to slightly push it and turn in counterclockwise by 90 degrees. The photo below shows the spring and the guide pulled out. 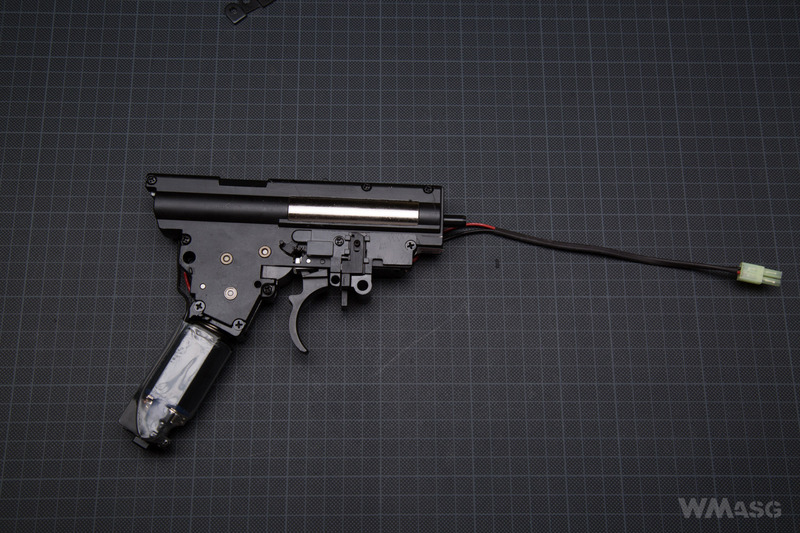 Of course to do this, you do not need to pull the gearbox along with the pistol grip from the receiver. 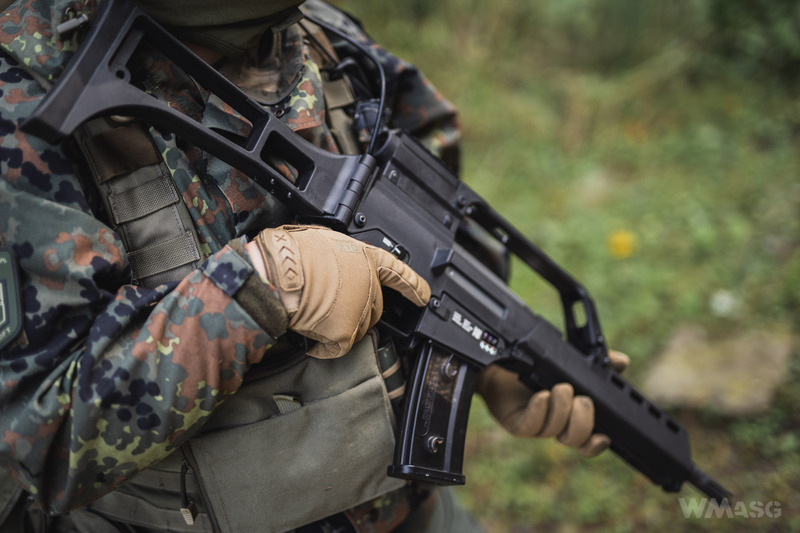 The carbine is disassemble similarly to other replicas modeled on the G36. 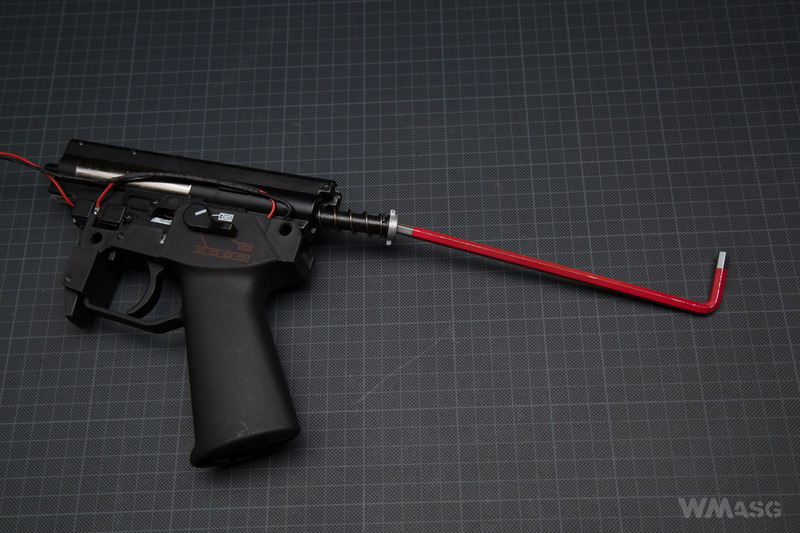 A good idea is that the 3 main pins of the replica, and thus the pin locking the front grip, the pin of the magwell and the pin locking the buffer are the same. They fit very tightly and are additionally equipped with a safety spring. This is good, because it will be harder to lose them. It is necessary to use a tool for inserting / taking them out - at least until the holes get wider with use, doing it with a finger is impossible. Of course, in the buttstock, as in the real firearm and other replicas, there are holes in which removed pins can be stored. This is to prevent them from being lost. 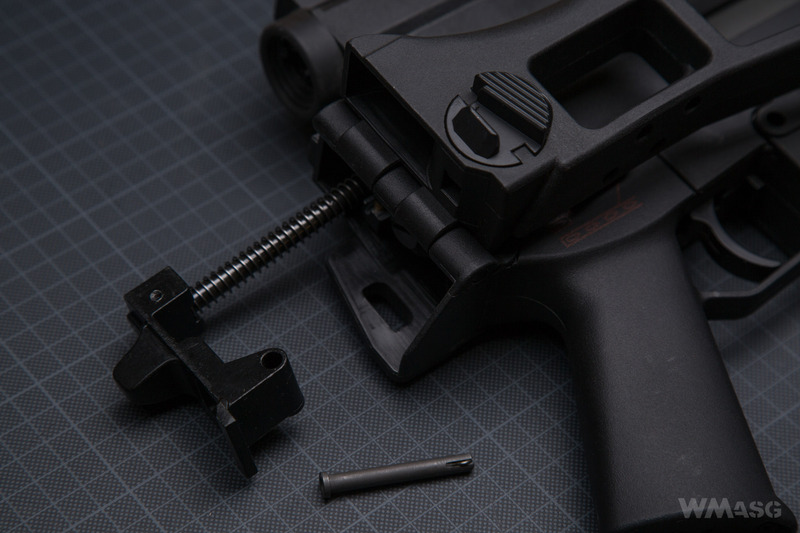 After removing the pin below the from sling mounting point we more the front grip forward, in the direction of the barrel's end. The are no guiding parts there. 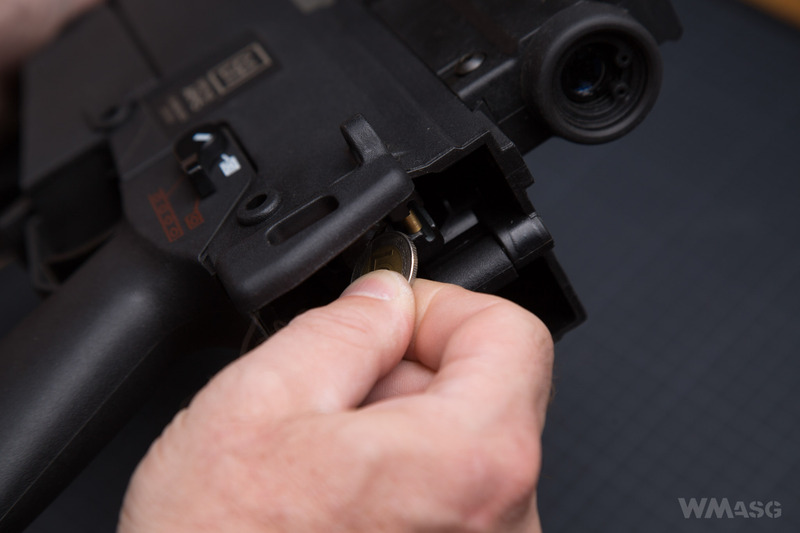 Taking the magwell off is similarly easy and typical: you have to take out the pin, press the magazine release button and you can take the magwell off. 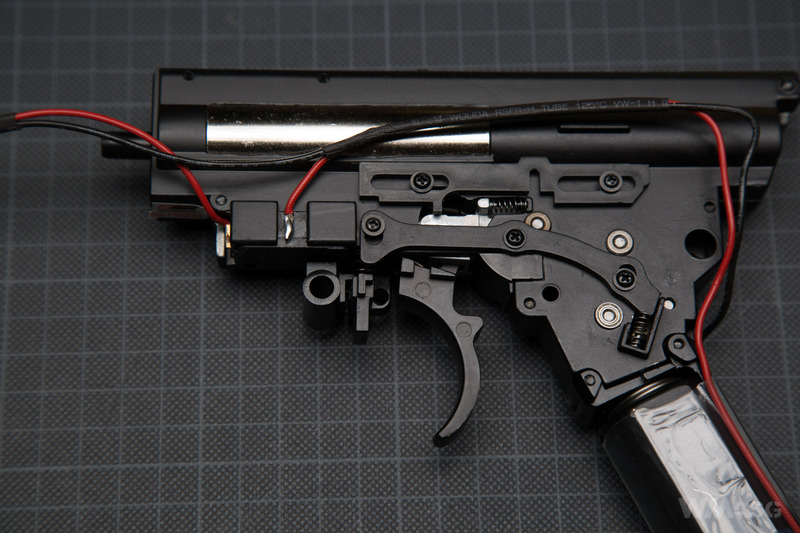 To remove the pistol grip with the gearbox you have to move forward and hold the Hop-Up chamber. Removing the gearbox frame from the grip is a bit of a problem. 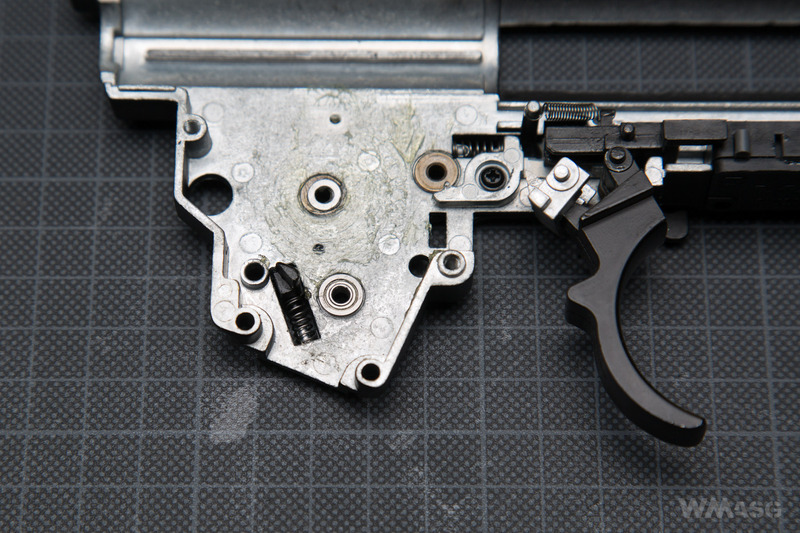 In addition to removing the screw located almost in the centre of the lid of the pistol grip, it is also necessary to take out the pin located above the trigger. 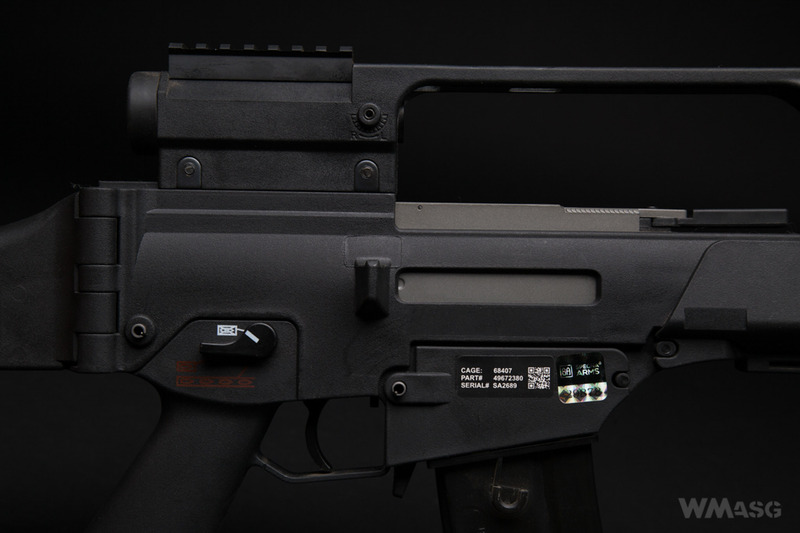 In many other G36 replicas, to remove it, you have to press the bolt catch button. It's different here. 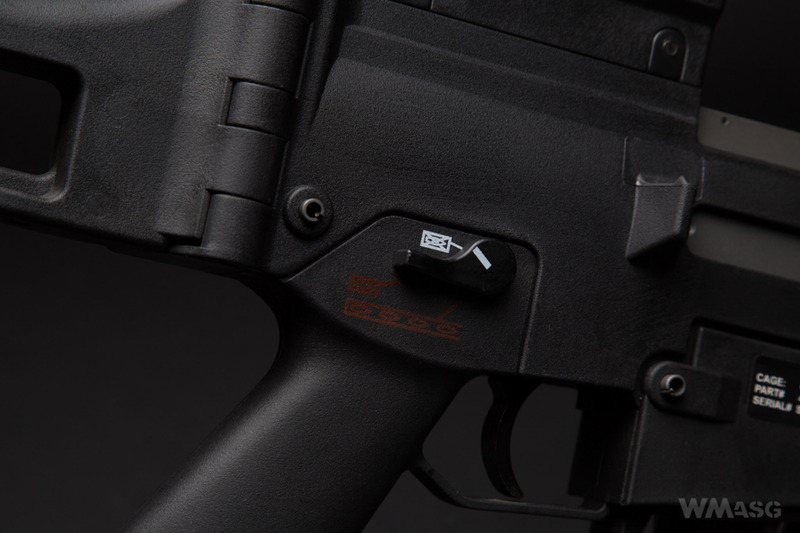 The pin simply needs to be removed, because the bolt catch button has a completely different function. 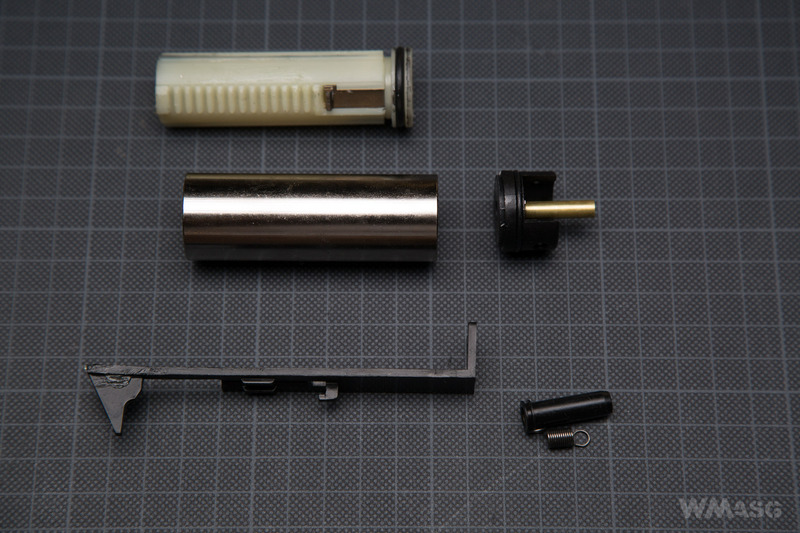 The problem is to bypass the internal spring retarder release cam of the left selector. You have to maneuver strongly, but with feeling. 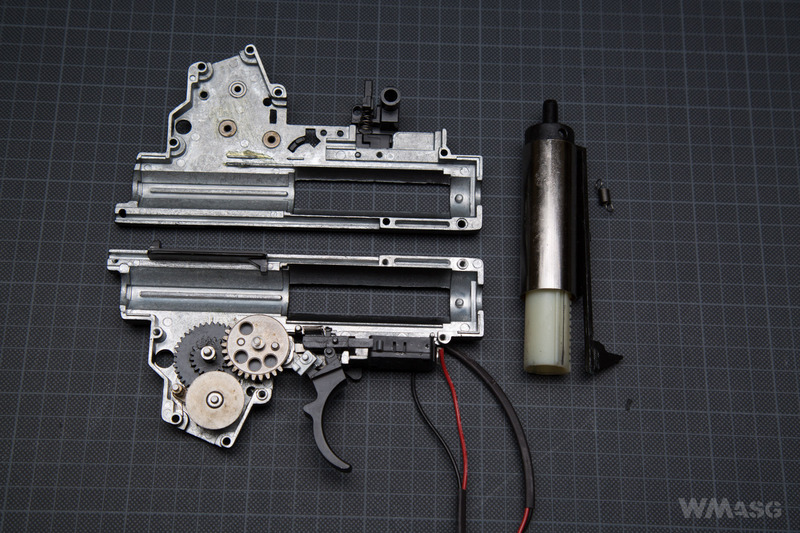 Gearbox is a custom, modified frame of the V3 type with an EBB system and a microswitch. It is similar to the one currently used in the A36 and AS36 replicas, but without the EFCS electronic control module. 7 mm bearings are used in it. 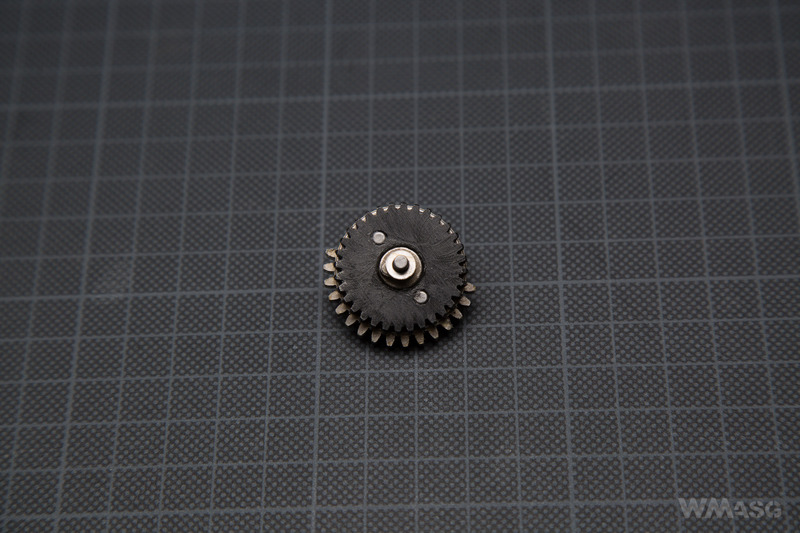 The bevel gear is mounted on steel ball bearings. The other gears are mounted on steel bushings. 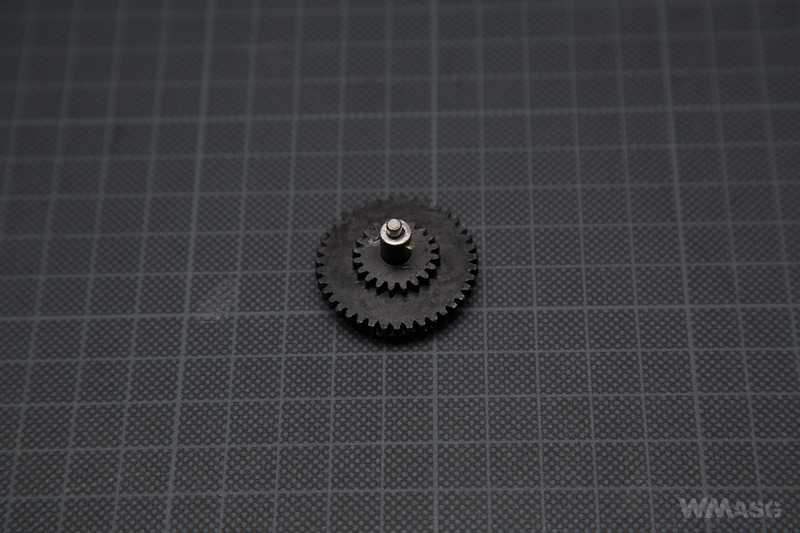 The gears are fitted with a slight slack. 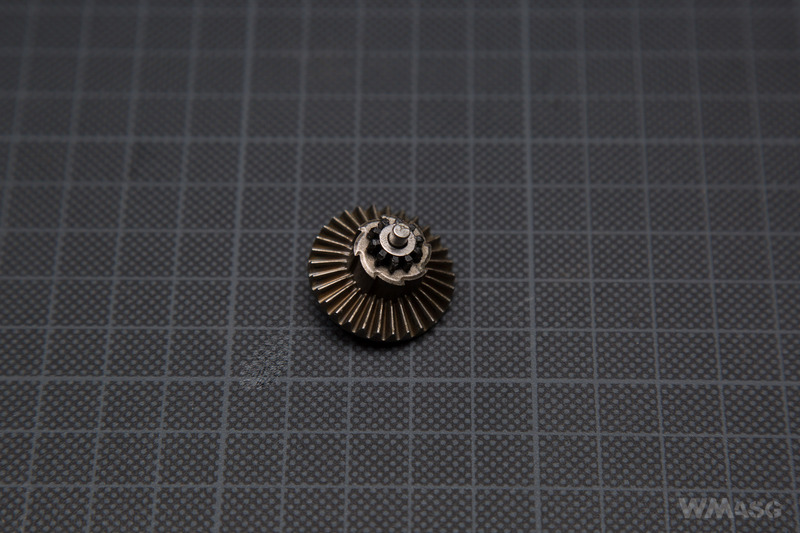 This is particularly noticeable bevel and spur gear. 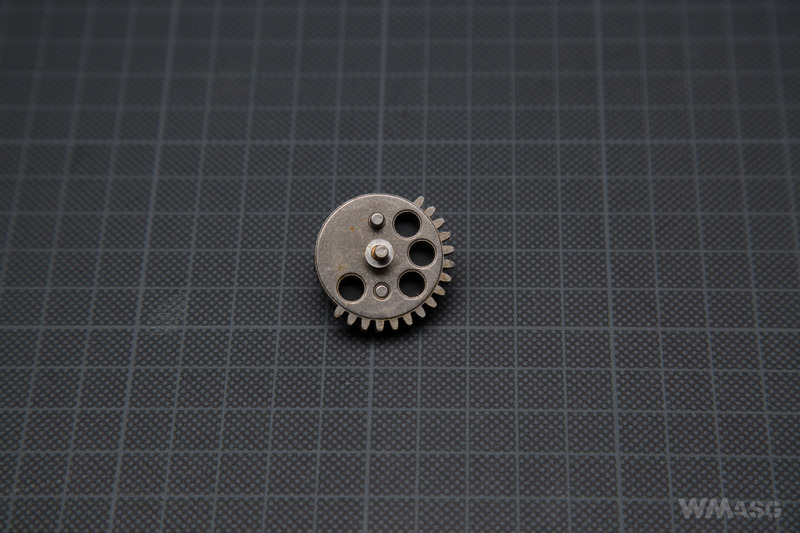 Steel gears look robust and are made with precision. They look similar to the more expensive models made by SHS or the cheaper ones made by Super Shooter. Fitting of the gears inside the gearbox is mediocre. As mentioned above – there is considerable side slack. Lubrication is modest. Too modest. 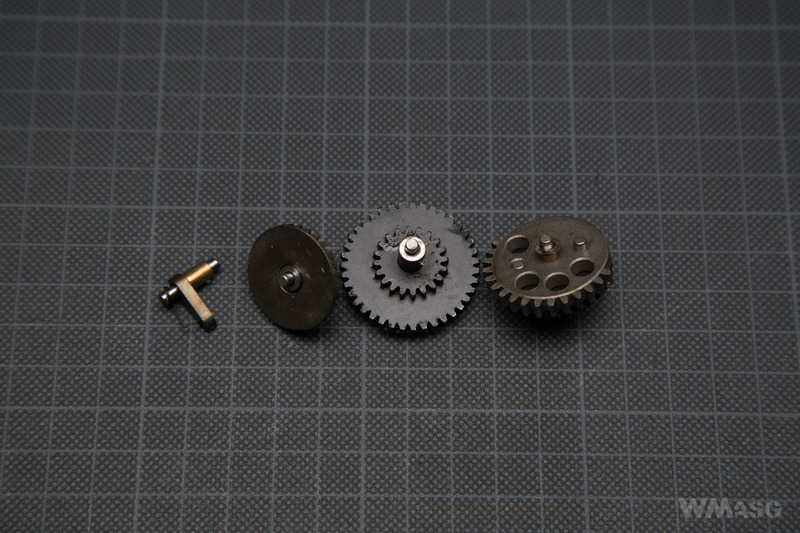 The sector gear is made from two parts. 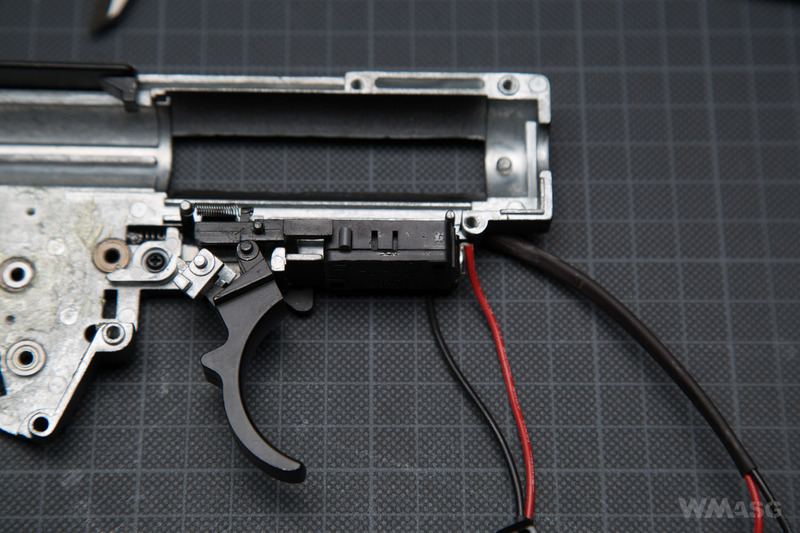 The anti-reversal latch is standard, connected with an external lever to a button which, in the real firearm, would act as a bolt catch. There is the system that is responsible for releasing the spring. In the tested unit it worked with a slight grind because of the short traverse of the lever that moves the latch. The button has to be pressed all the way in, using considerable force. It is impossible e.g. to release the spring with your index finger used to pull the trigger. The cut off lever is standard. The K version on review here has an inner barrel 363 mm long. Despite this a type 0 cylinder has been used - the one that has no holes. The cylinder is made of brass and is chromed. The cylinder head is made of polymer and it has 1 o-ring. It is made in the TM V3 gearbox standard. 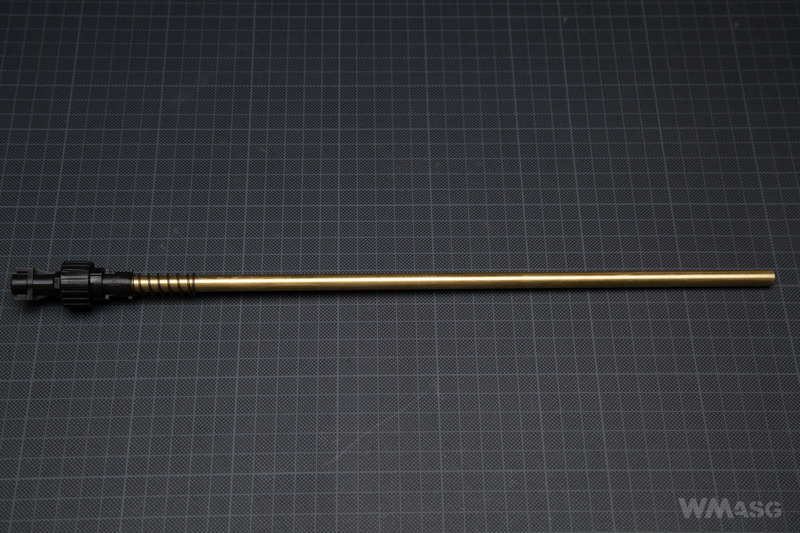 The head's nozzle is made of brass and is quite long – over 21 mm – as in e.g. 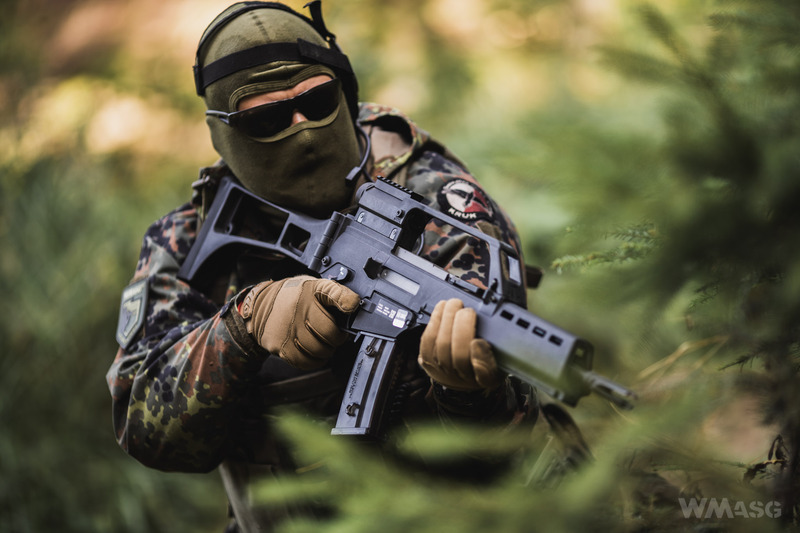 G36 or the AUG by TM. The head's buffer is made out of soft rubber and is 3 mm thick. 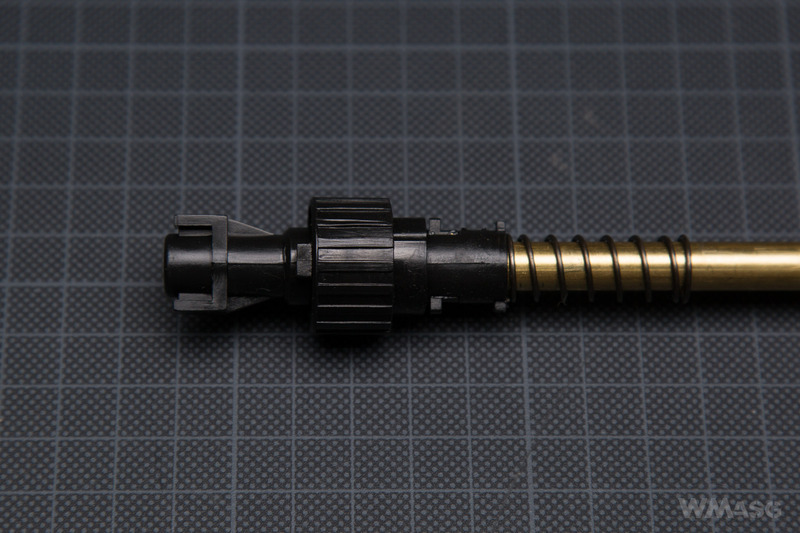 The nozzle proper is plastic, has no O-ring, its cross section is round. It does not have a guide on its top and is 24,91 mm long. The piston is also made of polymer and has 15 teeth. The last one is made off steel. The piston head is made from the same kind of polymer, it is directional and has 8 ventilation holes. It is designed one-time mounting – its front mounting screw has been covered by a glued in piece of plastic. It does not have a bearing. The spring is of linear design. It is very short, only 14,2 cm long. The guide does not have a bearing, is made of plastic and has ZnAl base. The guide's stabilizing screw is made of steel. The tappet plate is standard and made of plastic. 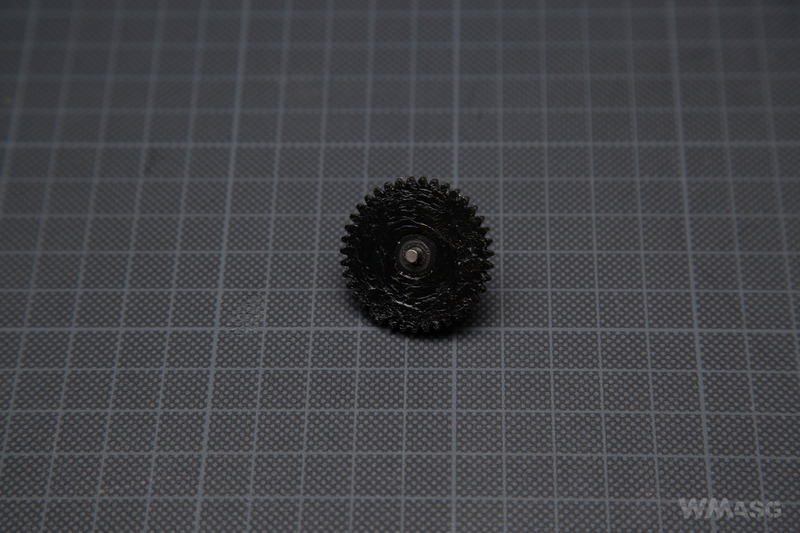 It is typical for ones used in V3 gearboxes. In the described unit the pneumatic system was dry – it had no lubrication. The seal was average. It leaked air between the cylinder and the cylinder head. 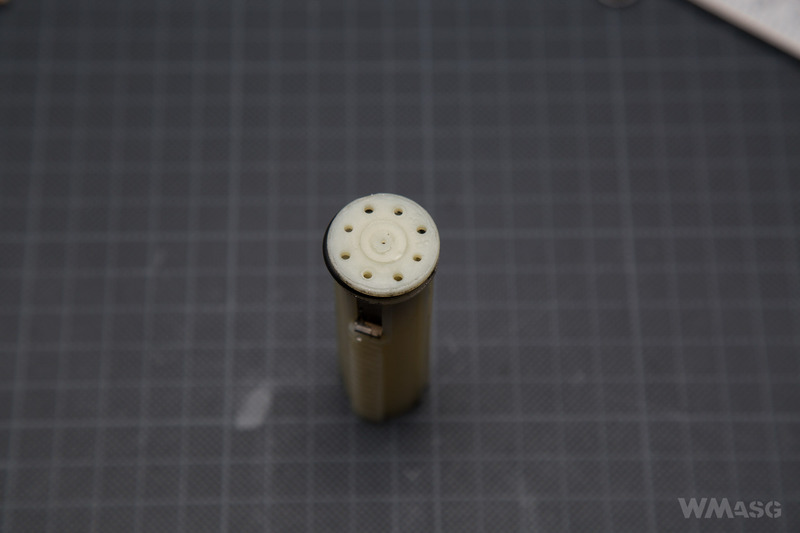 Tests with the nozzle put on also produced average results. 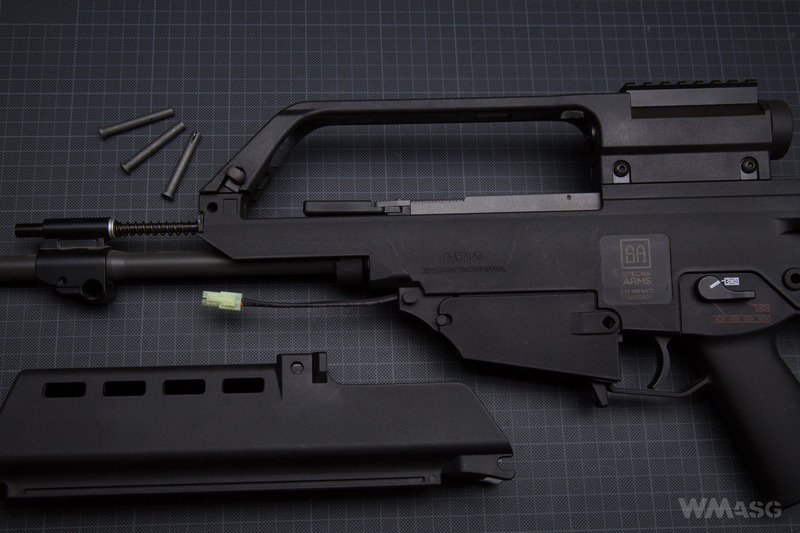 Trigger parts are standard for a G36 replica. The spring below is difficult to mount as one of its ends if rather short and does not secure itself properly in the gearbox frame. The micro switch is a part that many different manufacturers use nowadays. Unfortunately, using in required the gearbox to be modified which, in my opinion, is a drawback. Firstly, by using a micro switch we drop a standard. The gearbox frame is different and the availability of the gearbox itself and the parts (levers) that work with it is none. 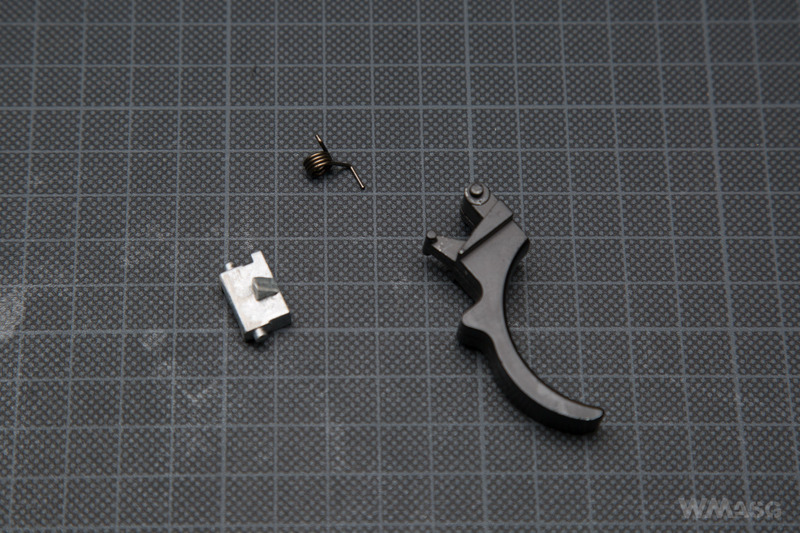 Secondly, in case of a failure of the micro switch getting the replica running again, after exchanging the micro switch for a similar looking one may by difficult because of the design and workings of the trigger-cut off lever-micro switch lever-micro switch set. The carbine uses thing and stiff electrical cables in hard insulation. The electrical circuit has no fuse. The cables are soldered to the micro switch and mounted on the motor using electrical connectors. The battery is plugged into a mini Tamiya plug. 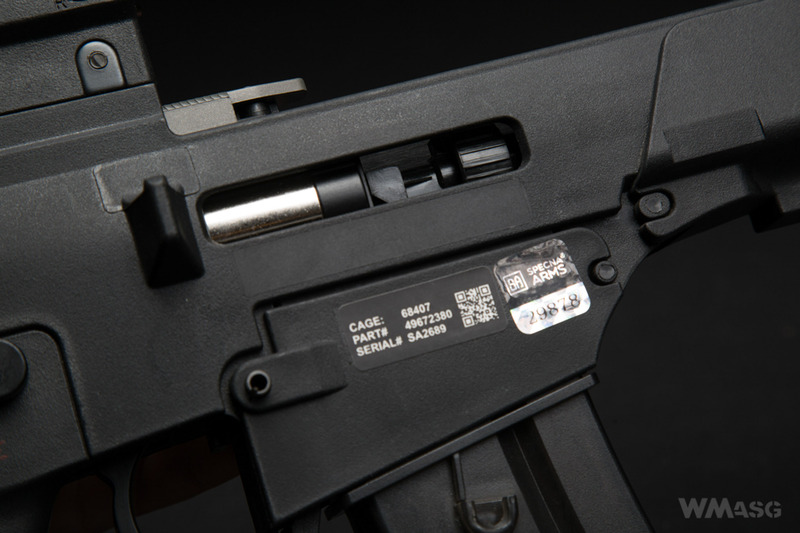 The fire selector plate is nonstandard. The fire selector switches are mounted very nicely and in a well conceived way. The ever loosening grub screws, which resulted in the switches falling off all the time, here they are mounted using regular screws but tightened from inside the receiver. 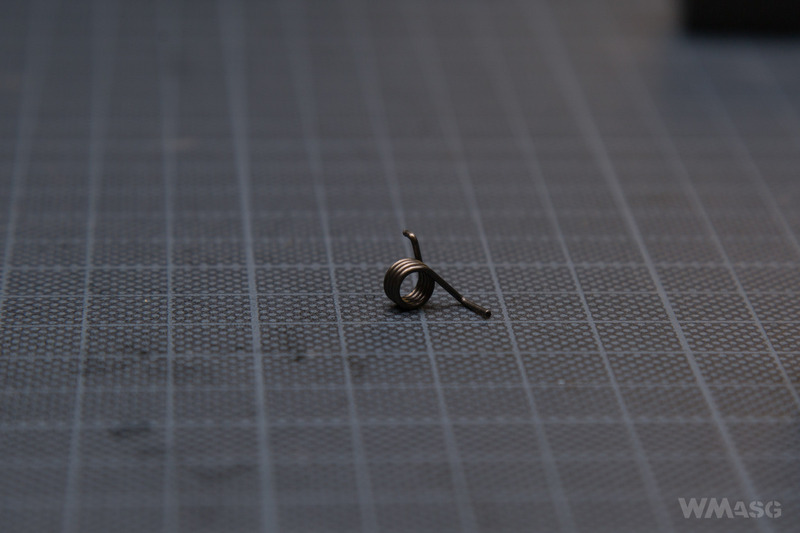 Therefore, it connects that parts using a thread and not pressure with a counter-screw. It is a much batter solution. The motor is a short type one and has no markings. The magnets are weak. The resistance of the axle turned with fingers is minimal. 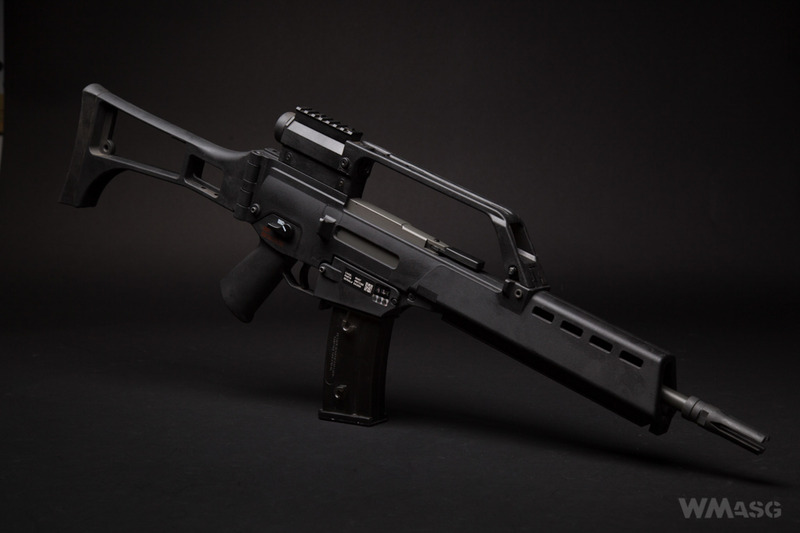 The motor frame is standard for G36 replicas. The motor position is adjusted using a 2 mm Allen key. It is possible to do it in the field, through a hole in the bottom lid of the pistol grip. The position of the motor in the tested unit had to be corrected. The whole gearbox worked with a noticeable and audible resistance. The inner barrel is made of brass and is 363 mm long. It does not stand out with anything special. We could not find any confirmed information about its inner diameter. 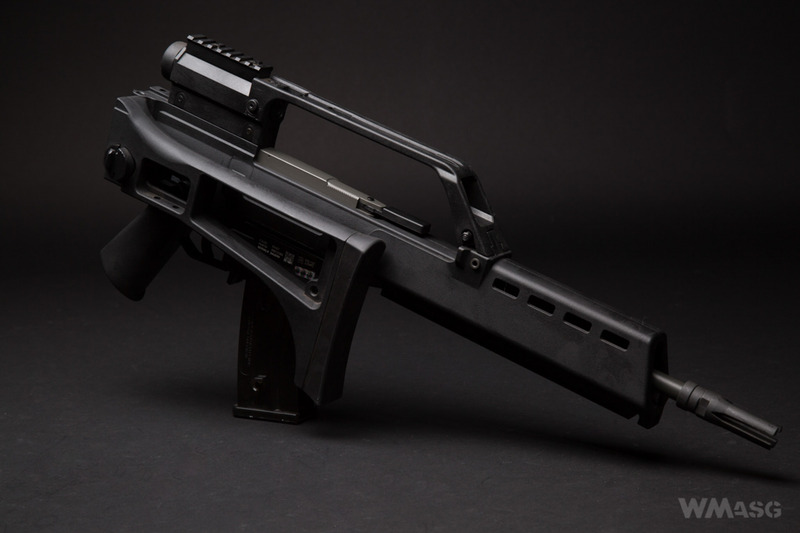 The Hop-Up chamber is typical for a G36 replica with a adjustment ring rotated around the barrel's axis. Turning it up make the HU stronger, turning it down makes it weaker. 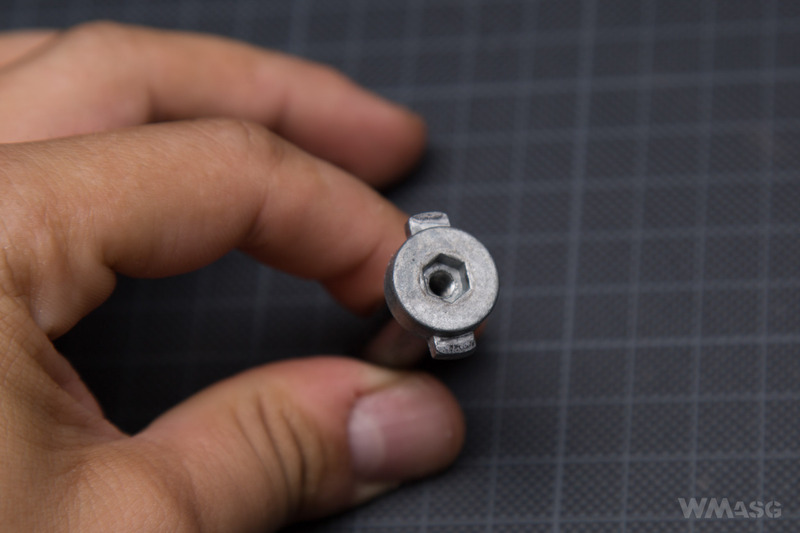 The chamber is designed for plain nozzles (without the guide in the top part). The Hop-Up bucking is black and standard. The spacer is also standard, soft and in a shape of a cylinder. The chamber and the barrel are pressed hard against the gearbox by a spring mounted on the barrel. To mount the chamber in the receiver you have to push it all they way towards the barrel end and than twist it 90 degrees right. To take it out you push it forward and turn in 90 degrees left. A word of warning – to insert the barrel into its socket we have to first turn it 90 degrees so after it is pushed and turned it lands in the proper position. The tests were carried out on our own enclosed shooting range, at an ambient temperature of 25ºC, the Hop-Up was set to zero. The measurements were made with the XCORTECH X3500 chronograph using Nurpol 0.2 g BBs. Average: 408,3 fps. Average from 5 factory made measurements - 377,3 fps. I do not understand and nor know how this is possible. Do we have thinner air in Poland? 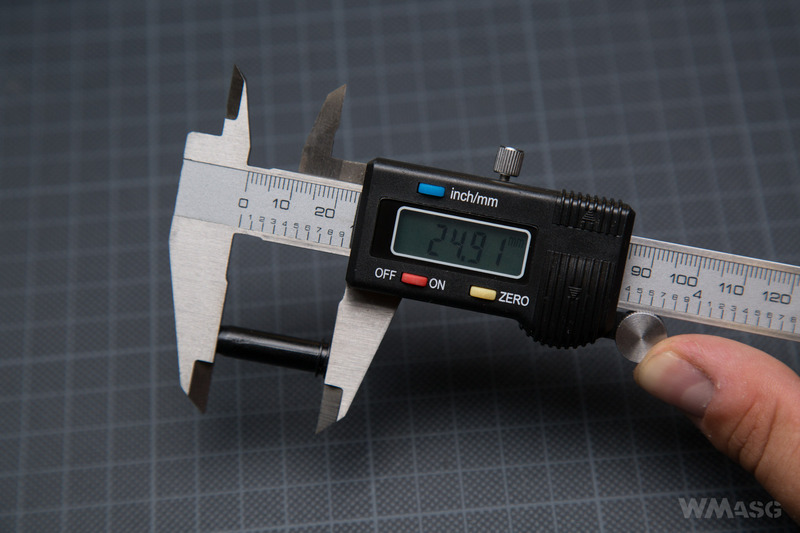 Do do not take into consideration that the factory made measurements simply did not take place. 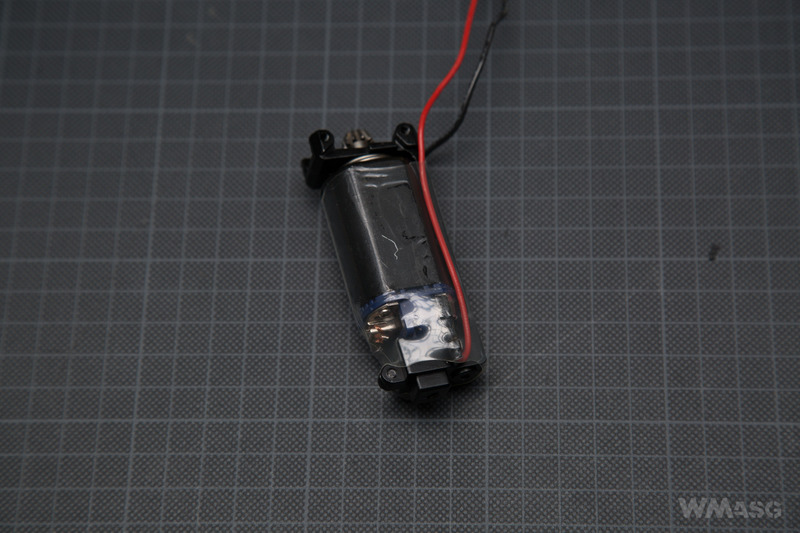 Measured rate of fire (LiPo 11,1 V 2400 mAh, 15 C battery) - 19 BBs/s. We used biodegradable 0.25 g BBs by Nuprol for this test. 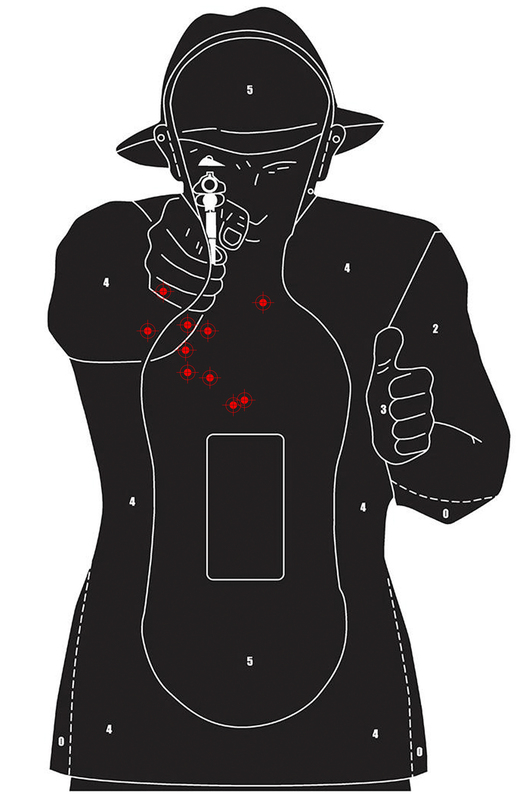 The distance from the target was 25 m. The shooting was done from the K-Zone shooting rest. 10 shots were fired from a replica pulled straight out of the box. We did not adjust the sights. All shots hit the target, the largest distance between hits - 11 cm. 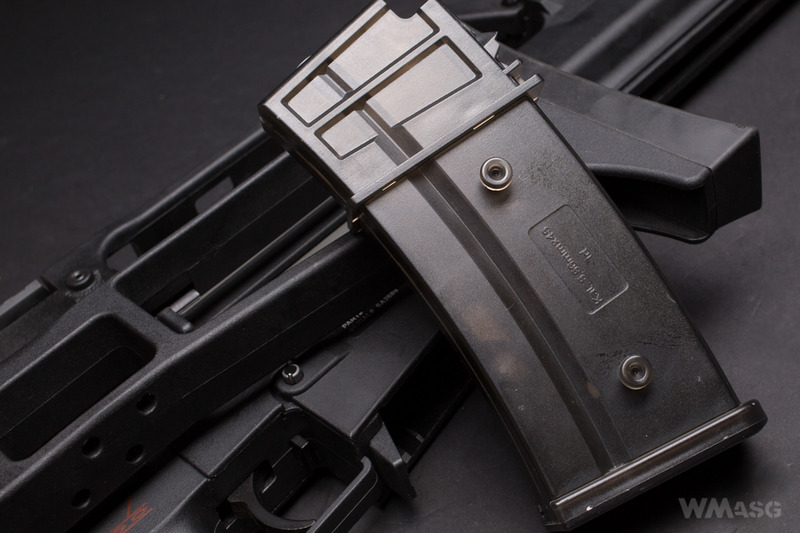 The A-G14 looks better than most popular G36 replicas available on the market (like JG, CYMA). Fitting of parts is better and materials used are batter too. The internal parts used are not of top quality but they are not bad either. Right out of the box the replica has a muzzle velocity of about 410 fps, therefore I will risk a theory that, without exchanging the main spring, therefore without increasing the mechanical stress, it is possible to achieve a muzzle velocity of 450 fps, or slightly more, by making the pneumatic system more airtight. Deviations from the "standard" which I pointed out in the text and which, to put it mildly, are not advantages, for others may be an incentive to choose this replica. To each their own.